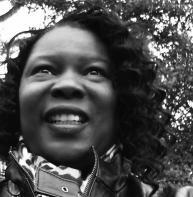 Telisha Moore Leigg, a wife and mother of twin boys, teaches magazine journalism and Japanese. She has an M.F.A. from Warren Wilson College, has published in the anthology, Long Story Short: Flash Fiction by Sixty-Five of North Carolina’s Finest Writers, Stickman Review, Gulf Stream, Primavera, and Crate. She received honorable mention in Glimmer Train’s July 2012 Very Short Fiction contest, and she writes flash fiction stories for Evince Magazine. Currently, she is working on a collection of interconnected short stories set in the South that deal with death, loss, secrets, and spirituality, titled The Fire for Lucky Horseshoes. Her prattling made me forget what I used to know, what I wanted, before I came in here. Carol Mark. She’s a manager at one of those home improvement places, pops gum when she talks; her brown hair is in a long braid down her back, and nowadays, just as in school, she has these spastic poodle bangs. I can’t stand her. She makes it a point, whenever I come into the store, to point out to me the brand that she buys, and that she gets a discount “on account of her being the manager.” I could tell her it’s a waste of salesmanship with me. I always buy the economy lamp, cheaper vacuum, the non-name-brand mop, etc. And I won’t take her discount that she offers. Carol Mark is always trying to sell me more than I want to buy. She always says she got something stronger, better, purer in form than what I have in my cart. I say no, thank you, Carol, and she looks at me funny, says I can use her discount, but I never do. I can’t take many things from people, and I can’t take things from Carol Mark at all. I say this one I’ve picked out is fine, whatever it is, even though the last time I didn’t really want the tack nails. Today she moves on beside me in the paint aisle leading to janitorial cleaning telling me about Oxyclean in industrial, bulk amounts. I move on in front of her until I finish whatever little shopping I do there. I don’t know why I don’t like her and why she still likes me. I always feel like I am not understanding something, and I am more than glad to hear that Sustain will get another home improvement store soon; a chain of them would be nice. I lied. Carol Mark sold me one thing. I bought some nails, carpenter nails. And I told her not to give me the discount. And she did it anyway. And yes, we went to school together. And yes, we got history. And Carol Mark thinks she knows me, but I don’t think I know anyone. More lies. I’m full of them. I know why Carol Mark thinks she knows me. Back in the fifth grade, she couldn’t hide the bruises from the teacher, Mrs. Logan, and so Carol Mark sat there with me, holding her side, holding that bruised or maybe broken rib that told on her. We both sat in the principal’s office, me for fighting Marcus Larkin on the playground, and she for getting beat up but not by me. It was Thursday; our school was one of the schools that still had the rusty swing sets, the wooden climbing boards, and still served fish and black-eyed peas on Fridays. We were the poor, county kids, and city-school kids thought we were hayseeds who wallowed in fields of dirt and ignorance. What I remember to this day is that no parents came for her, but some lady came with soft auburn hair, came and knelt down at her chair. That lady smelled like the Winesap apples that grew on my now-dead grandmother’s backyard tree. “Am I going home?” Carol wore a torn and smudged yellow top and had toilet tissue peeping out of a pocket of gray-blue jeans. And here’s where it gets sad because Carol Mark and I weren’t friends. She was just some skinny white girl who always had bruises, and was dirty, and who swallowed the fluoride mouthwash that the county made us take like it was juice, and was always ducking and dodging someone’s arm even when they meant her no harm. The black kids pitied her, thought she was po-white, and here she was looking at me, who had a mama and a house even if it was an old one, who was clean, as if we were the same. We were not the same. Mr. Belvers came out of his office and raised his fingers to put a hand on Carol Mark’s shoulder but she flinched, and the social worker came up and blocked him from view. Mr. Belvers got a quick blink to his eyes, and you just knew that none on his children were like Carol Mark. “Emma has to stay with us, dear. Things will turn out all right,” Mr. Belvers said. He was a quiet man who took the gifted children to the planetarium in his Jeep when the school system couldn’t afford the bus. “I’m scared, Emma.” She reached her hand for me. I kept thinking even now that we weren’t friends, and that I was going home, and that I was going to go to sleep when I went home, and that I didn’t live in no trailer like Carol Mark and have fifteen smelly dogs and cats, and always be standing at the bus stop in too-short coats. It felt good that someone was poorer, needier, and sadder than me. I looked at her and moved my hands into my lap. We sat beside each other for English and art. That was all. “Why come Mama ain’t here?” and she says this over and over, her green eyes fleeing in tears to lightly touch everyone in the room. The secretaries sniffed and turned to their papers. Mr. Belvers didn’t reach out his hand anymore, but you could tell he wanted to. Carol Mark was weak so I turned away from her to Mr. Belvers, hoping he would talk about my latest fight. The air smelled trapped, like the Styrofoam pellets inside of someone’s old cardboard box rain-wet. The social worker was trying not to touch her and still manage to get her up. She slowly lifted her hand toward Carol Mark. They took her away in a small, gray, two-door sedan. She looked back through the rear window. Mama picked me up; she took off work at the mill, and we went to our home that we rented but we fixed everything ourselves. We dragged the deadwood from a long-gone neighbor’s field to make fire in the Ben Franklin fireplace in our tiny living room. That fire that heated two rooms of our house and smoked the living room walls left the other two rooms cold. And my grown, speed-pill-popping, and St. Ides 40-ounce-drinking half-brother was there, quiet and mostly angry, him and his beer bottles that he half-hid under the living room couch that my mama pretended not to see. So Mama took me home, and that older half-brother beat me in absolute silence with his wide leather buckled belt much too hard and much too long while Mama wrung her hands, grabbing at his fingers, trying to find a way to stop it, anything to stop it. Until…until he raised his hand to her too, didn’t touch down, just raised like a question that she didn’t want the answer to. And it was cold in my house. I remember that. I remember that after a while, I didn’t want to fight anymore. That night I thought about Carol Mark and wondered where she was. And I knew I was better than her, and I knew that things were better for me. And the fire had gone out and it was cold. And when I go into that store, I feel cold when I got to see her smiling face. In over twenty years Carol Mark’s face hasn’t changed. Carol Mark still has that sheep-gone-to-pasture look, her green eyes deep pools of some sweet future. I wonder why I didn’t get that personality, why I didn’t get that hope. I never said good-bye that day. I never said anything as they took her away, her face almost like a woke-up full moon in the backseat looking through the back window. And Mr. Belvers, who sat next to me, the man who we secretly called Mr. Blinkers ’cause he blinked so much. He said, all deep and exhausted in a way, that didn’t I want to tell him something. And I told him about Marcus Larkin and how he pushed me into that red playground dirt, and he asked me again if I didn’t want to tell him anything. I set my lips like a mule until he looked away, more sad in his blinking blue eyes, until he went into his little principal’s room off the main office. I’m still lying. Carol Mark and I were friends, had been since kindergarten. On the day the county social services took her away, Carol Mark was in the bathroom early from recess at North Montgomery Elementary School, and she was washing herself again, but she couldn’t raise her left arm and her breath was hitching. I was in the bathroom stall hiding from recess, putting on fake plastic lip gloss from my Beauty Secrets Barbie plastic makeup compact. And the teachers knew to leave the loners alone, the ones no other kids really would play with. I’ll tell you the thing that shames me. This shames me. Carol Mark and me in the bathroom stall of our elementary school and me wrapping toilet paper around her waist over and over because she was hurting so, and I didn’t know to do anything else. Her green eyes were crying and me…me telling her stop crying, that they would take her away…and her saying so softly that it hurt too bad and me saying shhhh…shhhhhh, and please, and be quiet, and more toilet paper around that rib. And I remember how even at school it was warm in the bathroom by the last stall. I remember how we had both talked about that. Shhhhh…I said, knowing that my plea for her not to tell wouldn’t matter now. Carol Mark was going to tell, and I would lose the only friend I had managed to make. At nine-and-a-half, I saw the future and it seemed sad. So, in the rest of recess, I fought Marcus Larkin in the red dirt of the school playground, and I didn’t feel the pain, the bruised cheek, or the busted left knuckle. I didn’t notice the rip in my white sweater. I was there when they called up Carol Mark. “Cain’t Emma come with me? I doan wont go by myself.” But I didn’t go, and school years passed, and she was in the foster system, and I was right about the future being sad, me always ducking my eyes when she waved in the school halls. This Tuesday I remembered what I forgot in that home improvement store. I bought a hammer I don’t need. I will put it with all the other tools I buy and can’t figure out how to use. I know I could ask Carol Mark, but we aren’t friends like that. And all I got to redeem me is that this is Tuesday, and Carol Mark gave me that discount. And today I took it.